Dr. V. Krishna from Bangalore presented an engaging lecture demonstration on the language of percussion. Since the previous lecture had been on a serious topic, Dr. Krishna chose to start with a ‘Kadi’ joke to lighten up the sombre mood that had been created. ”What do communism and Gokulashtami have in in common?” The answer-“Karl Marx”. On Gokulashtami, we draw Kal (foot) marks of Krishna in our Kolams. After giving a brief overview of what was going to be covered, Dr. Krishna dove head first right into the subject. He stated that though the language of percussion is widely appreciated, it is little understood. The main subject of discussion was Layavadyas. Dr. Krishna stated that there are many percussion instruments that are Layavadyas and vice versa. For example Jalatarang is a percussion instrument but not a Layavadya. In the same way the morsing is a Layavadya but not a percussion instrument. Dr. Krishna focused on the main Pakkavadiyams like Mridangam, Khanjira, Ghatam, Tavil, etc. for his demonstration. What is a language? A language is a vehicle of communication used to convey some idea or meaning. Syllables are the primary building blocks of a language from which words, phrases and sentences are developed. No language, however, is uniform and complete in itself. Languages are also prone to evolution over time. We often hear that music is the universal language of mankind. Though there are many who fail to agree with this, Music is a medium with which people can cross the boundaries of nationality, etc. The meaning of language in normal parlance may not be apt in this context, but as music stimulates the sense of hearing and inevitably conveys information it can, to some extent, be called a language. Rather than an exact meaning, music conveys the more subtle concepts of emotion. Then the discussion narrowed in on the musical language of the layavadyas. There is a reduction in the scope of what you can convey in terms of ideas, etc. The foundation of any music is generally Nada and Laya (Nada being sound and Laya, the periodicity of the sound). Vocalization of this language is called ‘Sol’ which literally means syllable. A “bundle” or combination of such ‘Sols’ is called the ‘Solkattu’. We can divide this language into three sub-languages—the vocal rendition (called Konakkol), language of the notation and the instrumental expression language. Dr. Krishna now began to show us the basic sounds on the Mridangam. He then proceeded to show us the demonstrations of different Sols on the Khanjira, Ghatam and the morsing. 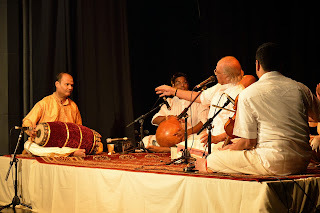 The first video was of G. Guruprasanna (Khanjira) playing the basic Sols “Ta Dhi Tom Nam”. He executed these syllables with exemplary ease. These Sols were also shown on the Ghatam (played by Giridhar Udupa) and Morsing (by Rajashekhar). These artists were also shown playing more complicated Sols. Dr. Krishna also played a video of his guru, A.V. Anand. The audience got a close up look at how the morsing produces sounds when held between teeth or when held between lips. It was truly fascinating. The next thing Dr. Krishna did was to define communication. He said that communication is not about what you say but is about what the other person understands. In the same way, if a mridangist does not successfully communicate to the audience during a Tani avarthanam, the people are likely to walk out to snack on a samosa. Thus if a percussionist wants to effectively convey something to his listeners, he must avoid playing bizarre phrases and keep the Kanaku to a minimum. This is where Sol development comes into play. In Sol development, rather than playing an outpouring of mathematical patterns, the artist gradually builds up on the Sols. In the end this leads to a complex mathematical pattern, but the subtle gradualness makes it easy for the average layman to take in. He talked about vilamba laya and madhyama laya sol development. Dr. Krishna also played a few tapes of Tavil Vidwans like Yazhpanam Dakshinamoorthy in which Sol development was consummately demonstrated. He also demonstrated Palani Subramania Pillai’s famous Sol. Pressed for time, Dr. Krishna also quicly showed farans and urutoos on all three percussion instruments. Dr. Krishna concluded by saying that the language of the Layavadyas must bring three feelings to the heart. They are Dhruti or the melting feeling, Deepti or effulgence and lastly Vikasa or the feeling of bliss. Born and raised in California, Vani Ramamurthi, a student of the sisters Ranjani-Gayatri, is one of many youngsters from abroad who have found Carnatic music to be their calling and made Chennai their home recently. 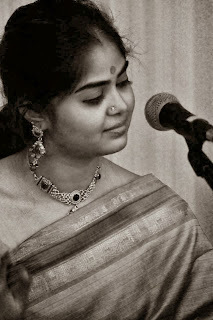 Her voice embodies bhava and melody. Vani spoke to Sruti about her musical journey. I started learning Carnatic vocal at the age of five in Irvine, California, from Smt. Padma Kutty. A dedicated teacher, she literally breathes music and offers her soul to each and every student. From the start, she placed utmost importance on the fundamentals of music such as sruti and layam. My parents created such an environment for me and my brothers that music was a natural and constant part of life, not merely an extracurricular activity. It was a family affair. We woke up in the morning to an alarm clock set to Sri KVN’s music; the snooze button was never needed. At almost any given time, at least one of the three of us (me and my 2 brothers) would be in some room in the house practising, either vocal/violin, solo/together. Music was played in the car; we attended concerts regularly as a family. It was omnipresent and our lifestyle wrapped itself around it! How did you come under the tutelage of Ranjani-Gayatri? I started learning from them in the summer of 2002. After a brief meeting in the US a few months earlier, my family and I met them personally when we came to Chennai. My brothers and I sang a couple of songs and before I could realize what was happening, we were taken to the next room and Gayatri aunty taught us ‘Marakata lingam,’ in Vasantha. That day, I embarked on the most significant and meaningful journey of my life! My perception of music changed drastically after my first summer with them. I began to appreciate music on a whole new level: the beauty behind each swaram, the importance of each and every nuance, the purity and richness of sound that stems from open akaram. I spent every subsequent summer vacation (for eight years until I finally moved here) in Chennai to continue learning from Ranjani aunty and Gayatri aunty. Many years I would travel alone, but missing friends and home wasn’t enough of a reason to stop me from coming! To this day, I thank my lucky stars every day that I get to know them on such a personal level and learn from them. Their inspirational music and personalities spark my unyielding desire to learn more and more! Also, I’m immensely grateful to my grandmother for so graciously providing me with the most comfortable home in Chennai. You grew up in a household with brothers who are also musically inclined. Surely there were squabbles about music? We hardly fought about music, to be honest. My brothers, Arun and Shiva (disciples of Sri Delhi P. Sunder Rajan), and I started learning vocal music together. They concurrently started playing the violin. Somewhere down the line, my brothers’ passion directed them towards the violin; they perform both as duet artists and as accompanists. They are like my 24 hour hotline; I can clarify any musical doubts with them at any given time. Practising with them is extremely beneficial for me. Apart from having a great time and creating invaluable memories, I learn so much from them. As our music training has diverged over the years, it adds more interesting facets and dynamics to our musical interactions. Today, it wouldn’t be strange at all to see me online on Skype at 3am, practising with my younger brother Shiva, back home in LA. As kids, all three bof us have performed together! These days, it’s either a duet concert by them, or one of them accompanying me. It’s always a huge comfort when they are on stage with me! Being able to share this wondrous art form with my brothers is a blessing and it creates a truly special sibling bond amongst us. How has living in Chennai changed your perception of music and your approach towards it? While living in Chennai, I find that music becomes truly immersive. Here, it’s more than a livelihood, it is life itself. Though music can be cultivated and developed anywhere in the world, I feel that Chennai is the place I should be. There are ample opportunities available to gain experience both in performance and listening, enabling me to grow at a substantial rate. The best thing about living here is the constant interaction I have with my gurus. I treasure each moment with them whether in class, playing the tambura at their concerts, or even a phone call. What’s your favourite venue in Chennai? Whether you’re treading the majestic grounds of the Music Academy where the rich legacy and tradition lingers in the air, or at the more contemporary Arkay Convention Center, you’ll find yourself a refreshingly unique experience. I have an affinity towards Sivagami Pethachi Auditorium in Mylapore, where Brahma Gana Sabha customarily holds concerts. I’ve had some glorious experiences there as both a performer and a rasika. My first ever December Season concert was held there in 2011. A combination of flawless acoustics and palpable vibes of encouragement from the audience created a beautiful ambience that allowed me to sing with a sense of joy. The following season (2012), I experienced one of the most mesmerizing concerts by my gurus at that venue. I could feel the energy ricocheting off the walls during the Kantamani ragam-tanam-pallavi. The venue has a certain intimacy between the artist and audience. 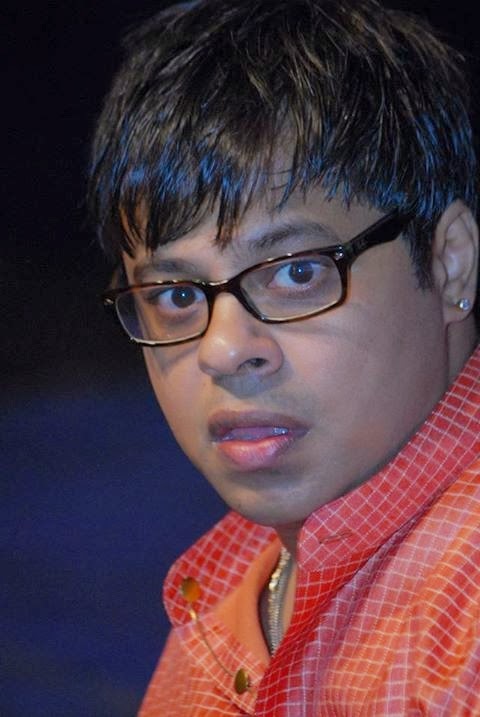 Have you found it difficult to be accepted because you are an NRI artist? I have never really thought of it as even the tiniest of hurdles. My place of origin has not had any effect on my efforts here. Though the ‘woes of an NRI’ is a recurring tea-time topic, I try to not dwell on the matter. After all, music is a meritocracy. Able and talented individuals will be suitably rewarded in the long run. It was 2010, the year of GNB’s centenary. I was one of the speakers at a weeklong commemoration at the Narada Gana Sabha. The chief guest each evening was a former ruler of a princely state in British India (Don’t ask me why). The evening Prince Marthanda Varma of Travancore spoke at the event, my mother asked me to try and get a private audience with him. “Your grandfather Sivaramakrishna Iyer was his private tutor after he retired as Inspector of Schools at Trivandrum. The maharaja once wrote an appreciation of him in a Malayalam magazine. Maybe he still remembers him,” she told me. That evening, though I heard a short but scintillating speech by Marthanda Varma, I had no chance to corner him and get a sound byte out of him about my beloved Anna (as we all called our grandfather). But I had an unexpected stroke of luck while having a cup of coffee at the open-air Woodlands café in the compound. When I apologetically answered in the negative, assuming he was asking me for a copy, he hastened to add, “I have a copy. I’ll send it to you.” I then gave him my visiting card, and eagerly awaited the photograph. At that moment someone approached him and complimented him for the fine speech he made that evening. “That was all because of his grandfather’s teaching,” he said, pointing to me. The promised photograph never came, but I cannot forget the graciousness of the former maharajah of Travancore. This year’s annual conference at the Music Academy began with a thrilling lecture on the folk music of Tamil Nadu, presented by Prof. K A Gunashekaran. His troupe consisted of Venkatesan on the tavil, flute by Mohan, vocal by Dhanalakshmi, and nagaswaram along with traditional folk dancer Pandiammal. Pandiammal’s head was adorned with a ringed feather crest. Nestled in the middle was a traditional brass water pot, which she carried with total confidence as if it were a natural extension of her head. At first, this genre of music might have seemed rudimentary to the classical Carnatic senses, as it seemed to lack structure at every level. There seemed no concept of sruti or tala, or for that matter, even lyrics. But as Gunashekaran gradually unravelled the art form, it became evident that these were real stories straight from the heart of the ordinary man expressed in an unbridled fashion. It gave the audience a complete sense of freedom, and a licence to emote freely without worry of any sort. These could be the stories of each one of us, despondent souls reaching out helplessly. These stories touched the listener and the performer in equal measure – Gunashekaran wiped tears from his eyes as he sang of the woes of a desperate farmer who had a meager harvest and pleaded with every known deity for divine intervention in vain. He said that such aspects as ragam and sruti were not prominent elements of Tamil folk music. It seemed as if this style had a specific therapeutic task and was used to express joy, sorrow, depression or news, and mourn, calm, or enliven. The contents of these songs were mainly stories of village life in Tamil Nadu. For example, the professor sang a few compositions that a traditional bullock - cart driver would sing. He also gave an example of a song that a person selling bangles would sing to entice a young woman with his wares. To make repetitive tasks like drawing water interesting, village folk sing songs to the rhythm of the rising and falling of the bucket and so on. The duration of the task at hand matched the phrases and made mundane chores a delight. Music was also used by villagers to express their problems. Even the almighty was not spared as He was chided and blamed for all the problems of the common man. This musical form has beauty in its simplicity. Gunashekaran gave a touching example, singing about a farmer talking to his mama. He says that he has tried everything he can for thirty years to grow rice and that he has failed. He needs to pay back a loan that he had taken for the purchase of the seeds. In an attempt to procure divine intervention, he says he has offered a goat to Mariamman, gone to Palani for “four mottais”, carried a kavadi and gone to Sabarimala wearing the traditional irumudi. He concludes by saying that in the end he barely has half a measure of rice. Thus we see the difficulties experienced by villagers on a daily basis. There are so many variables in life that need to align in order to reap the fruits of one’s labour. The simple farmer somehow seems to have a deeper understanding of life than most city folk. He cries from his heart, pours his emotions out, as onward he moves. Dr. Gunashekaran went on to talk about the different types of compositions in Tamil folklore. He demonstrated the different chindus like the Nondi Chindu and Kummi Chindu. He explained the story behind the Nondi Chindu (mentioned in ‘Tolkappiyam’) while answering an experts’ committee member. We also witnessed compositions about famous kings and queens. Aravalli and Sooravalli are example of such compositions. Temmangu, Pallu (a composition for the nagaswaram alone), taalattu and oppari are some of the other types of compositions that Prof. Gunashekaran touched upon with wonderful demonstrations. Gunashekaran then went on to talk on the importance of pakkavadyam in folklore. In Tamil folk music, pakkavadyam really supports the singer. Since there are no rules regarding sruti in folk music, the accompanists help keep the tune going when the singers swing from one sruti to the next. For instance in a high sruti it is up to the flute to keep the tune going, while in the low srutis the nagaswaram takes over. The professor stated that parampara did not have a specific role in folk music. Though most practitioners stick to traditional patantharas, a few change the tunes and stories in the songs. Ragas were mainly absent and most of the songs are set to traditional tunes. 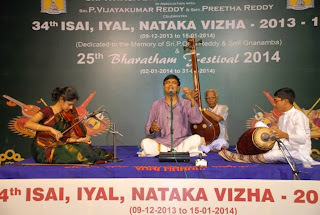 Improvisation in folk music is freer than in Carnatic music, with singers humming to fill up lyrical gaps. As the lecture came to a closing, Gunashekaran stated that the content of all these songs were the “complete truth”. He left the audience wondering if these traditions would live on. The Tamil movie industry has benefited from these traditions without giving traditional artistes due credit, Gunashekaran charged. Since this music is directly related to the daily routine work done by villagers in rural areas, the present generation of young villagers cannot relate to it at all, as most wish to work in the cities or do not perform work using traditional methods. The question “Will we let modernization ruin our precious traditions?” lingers. The Oxford English Dictionary defines art as "the expression or application of human creative skill and imagination, producing works to be appreciated primarily or solely for their imaginative, aesthetic, or intellectual content". Music, Dance, Drama, Literature, Painting, Movies - all are accepted and appreciated forms of art. But are all arts equal? Chennai, especially takes pride in the mushrooming number of Sabhas which are expected to promote Art. The mission statement of any such Sabha would be for the betterment and promotion of fine arts. And most of them are good at what they are doing which is promotion of just one or two branches of fine arts. But when it comes to photography, all of these institutions, in Chennai and elsewhere, are consistent in handing step motherly treatment. The moment someone takes out the camera there is a volunteer whispering a warning that the camera be put down or you would be ejected from the auditorium. Is photography not an art? Why is it not being given room by these institutions whose very existence is to promote art? The most common reason that would be given for not allowing photography is that the flash and the clicking noise are a source of distraction. The crisscrossing of these volunteers cause more distraction than the actual photographer might. Mobile phones ringing and talking loudly during concerts are disruptions. There are requests from the organizers for restraining from these activities. These are universally applied. But that is not true when it comes to photography. There are privileged photographers who are allowed to click photographs to their heart’s content. The organizers are happy to have their programs being reviewed in magazines and so the “Press” photographers are extended all courtesies. There are other ‘special’ persons who also have the right to click photographers. But the rest of the world, who have the volunteers materialize by their side when the camera comes out. How is it that photography by some is not a disruption while by the others are? It is ironical when these organizers, who so vehemently are against photography in their events, go to events organized by others and click away to glory. And they have no qualms in using pictures that belong to others without even a basic acknowledgement of the source, when it suits them. The other reason that is provided is that the artists do not want to be photographed in the middle of a performance. In my experience, barring very few, artists generally like to be photographed and have expressed their gratitude in getting their pictures taken and uploaded on to the internet. So this reason as well does not hold water. I have been to events held in some spectacular venues. There are very clear rules of engagement and they are universally applied. Those interested in taking photographs are required to register prior to the event. There are specific areas where these photographers are placed. There are clear instructions that they cannot move around during the performance and if flash photography is allowed or if there are specific segments when photography is not allowed. These are processes worthwhile to be followed in any event. Photography is a serious art and it captures the emotions of an artist like no other artistic medium. It documents history and preserves it for the posterity. We would do well to recognize and encourage this form of art as well. Let us allow photography its share of flashlight, um, I mean limelight! Tirunageswaram Krishnaswamy, whom everyone called “Kuttipayya”, was not from Tirunageswaram. His name wasn’t Krishnaswamy either. He was only eleven when the real Tirunageswaram Krishnaswamy, a little-known mridanga vidwan, passed away. Kuttipayya’s uncle, vocalist Tanjavur G.M. Ekamresan, was to tour Kerala with the real Krishnaswamy, but when Krishnaswamy’s sudden demise came in the way, Ekamresan passed off Kuttipayya as the deceased Krishnaswamy. The boy played to rave reviews, and the name stuck. Some people say Kuttipayya was lazy and did not develop his early talents. Others say that his talents were always limited, and that as he grew older, people judged him more objectively. Whatever the reasons, he remained a middling mridangam player, playing small concerts in the Tanjavur-Trichy-Kumbakonam belt. Outside of music, though, Kuttipayya was a rage. Tall, lean, bright and impeccably well turned out, he seemed to be perennially bathed in a warm halo. He didn’t speak much, but always had a quiet insight or two to offer. The doors of his house, conveniently located on the same street as the iconic Mahalakshmi temple in his town, were never closed for anyone. His wife, an eternally harried-looking woman, spent most of her time cooking for another set of unexpected guests. Musicians, dancers, dramatists, rasikas, priests, lawyers, and even petty politicians used his house as a resthouse. There were discussions on local issues, debates on the state of the nation, music concert reviews, impromptu jam sessions, drama rehearsals and even dance performances. It was said that no one ever passed his door without entering it. Every piece of gossip in the village started and ended in his courtyard. It was a precursor to the modern day coffee shop. Only, no one paid anything for the service. One day, my father took me to that hallowed courtyard. The topic of conversation that afternoon was the impending declaration of independence. Kuttipayya sat in a corner, punctuating conversations with his mridangam. The Quit India Movement had intensified, and the courtyard was convinced that independence was only a few weeks away. No one was sure how our lives would be affected when independence came (someone even said, “Nothing will change. We’ll still spend our lives in Kutti’s house drinking this coffee!” to widespread agreement), but everyone agreed that in principle, it was a good thing. “Barrister Aaravamudan will disagree,” someone said. Tarikita-tom, came Kutti’s mridangam. Everyone laughed. Someone else said, “Aaravamudan will smoke his pipe and declare, ‘The British civilised us savages. They brought the railways, post and telegraph. The British created the Civil Services. And our Gandhi preaches austerity and frugality. Ha! If we follow him, we will end up as beggars.’ “Takakitatarikita-tom, the mridangam rang. Someone declared, “Long Live the Queen.” Kuttipayya played a flashy mora, and laughed heartily. As if on cue, Barrister Aaravamudan walked in, dressed in white trousers and a white shirt, a proud red vertical vermillion streak on his forehead, his keen eyes peering through his golden-rimmed spectacles, his dark hair neatly combed in a side-parting. He carried a letter in his hand, and looked worried. “A hundred years!” my father said, as a resounding ta-tom came from Kutti. “So,” my father continued, “Will you move to London now?” The crowd chuckled. “Bhale, bhale,” the chorus said to the accompaniment of Kutti’s mridangam. Suggestions came thick and fast, but they were also rejected at the same speed. One musician was too old, another was too sloppy and yet another was too drunk. Kuttipayya was right there, but no one mentioned his name. I looked towards him many times during that conversation, and he simply sat expressionless, his hands on the mridangam, majestic as ever, his mouth filled with paan. I whispered in my father’s ear, “Appa, Kutti mama?” He shot me down with a wry smile. Finally, it was decided that distress letters would be sent to the top mridangam players in Madras and Madurai to see if anyone could come on that day for a modest fee. Aaravamudan said he would write to his lawyer contacts in the High Court to see if they could prevail on some musician to come from the city. The Quit India Movement sputtered to a stop, and it was generally understood that until the World War was over, India’s independence would take a back seat. I whiled away my days between school, the local playground and home, and had completely forgotten this conversation until my mother started taking the Navaratri dolls out of the lofts for the kolu. The next day, in school, my class teacher left early for what he described, in English, as a ‘grand lunch’ for Kutti’s impending fortieth birthday. When I trudged home from school past Kutti’s house, I saw a crowd of almost fifty people. I had never heard of any such celebration of a fortieth birthday before. What made it more curious was that the birthday itself was a month away. Appa couldn’t attend, I gathered, because he was assigned the task of picking up the Bhagavatar from the station. The Bhagavatar was as difficult and mean as he was known to be. He would only travel by car, and only with a “man of standing”. Since the Barrister was busy making arrangements, Appa, the postmaster, was deemed to be of standing enough. The Bhagavatar insisted that hot homemade coffee be served to him at the station in a brass tumbler. But when Appa gave him Amma’s near-perfect coffee, he complained that it wasn’t hot enough. He would only stay in an Iyengar household, and had very specific cooking instructions. The poor barrister was saddled with making sure his wife complied with those requirements without threatening divorce. For his afternoon nap, he inspected four pillows before choosing a particular combination of two, laid out on the bed in a very precise pattern. The Barrister was to wake him up at seven pm by knocking on his door exactly three times -- not once more, not once less. Then, he would have a bath (the temperature of the water and the brand of soap and perfume carefully controlled by him), eat uppuma (without any vegetables, except two small pieces of a slightly overripe tomato, and with a more than generous helping of ginger pickle) with hot coffee, and proceed to the temple for the concert. He had even told the Barrister when he wanted fresh coffee during the concert, and made it clear that he would stop singing if it wasn’t brought at that precise time. My parents and I went to the temple half an hour before the concert to find a healthy crowd already gathered. Someone found me a place right below the stage, while my parents sat in their customary place at the back. 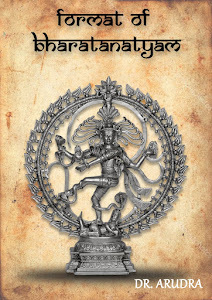 The Bhagavatar was already at the venue, we were told, and was waiting in the Barrister’s office next door. Some people did look excited about listening to this legendary musician, but many were more curious about how Kutti would handle this assignment. He hadn’t still left from home, the crowd murmured. About ten minutes before the scheduled start, a fairly large group of men and women descended on the venue. I recognised them as the same crowd that I saw at lunch at Kutti’s house that afternoon. They seated themselves around the stage in an even sort of distribution. They looked like they had some plan, as if they were organised, a part of something big. Five minutes later, Kutti arrived to much applause and fanfare. He placed his mridangam on stage and walked straight to the Barrister’s house to meet the Bhagavatar. The artistes finally arrived, about fifteen minutes late. The Bhagavatar, in a shimmering jibba, sporting an almost fully golden shawl, and crispest white veshti with a dignified zari border, led the way. Behind him was the frail, diminutive, ageing Pillai-val carrying his violin. And behind them, looking as regal as the Bhagavatar himself, followed Kutti, the vibhuti on his forehead reflecting the warm glow of the gas lamps. The first half hour of the concert proceeded without incident. The Bhagavatar was in fine form reeling off a bright varnam, a booming, heavy Ganesa kriti by Dikshitar, and two small Tyagaraja kritis at lightning speed. Kutti was much better than I expected him to be, and I realised why Appa insisted that we don’t underestimate him. The Bhagavatar, until then, did not attempt any humiliation. But that changed with his swaraprastaram for Ne pogada in Varali. It seemed the Bhagavatar had been testing the waters with his early exchanges, and once he gauged the level of his accompanists, he would take them to task. The khandachapu talam lent itself to mathematical madness, which was, in any case, the Bhagavatar’s forte. After the first two rounds, which were neatly followed by the accompanists, the Bhagavatar launched into a suspicious set of mathematics in the tisra nadai. My rudimentary knowledge of the technicalities of music meant that I had no idea what the Bhagavatar was up to, but I was worried when I saw a similar expression on Kutti’s face. 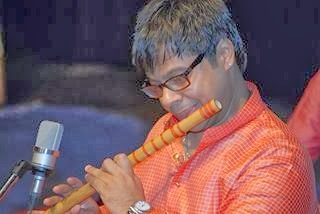 Pillai-val stayed clear of the entire dispute by playing his own thing, declining the Bhagavatar’s invitation to indulge in musical algebra and fractions. But Kutti had no choice. He had to accompany the Bhagavatar on those arduous journeys. After four rounds of the Bhagavatar singing what sounded like the same pattern over and over again, but was, actually, four subtle variations on the same theme, the Bhagavatar laughed derisively at Kutti. Kutti decided enough was enough. For the next round, Kutti overpowered the Bhagavatar with the sheer loudness of his playing. The crowd that had enjoyed Kutti’s hospitality that afternoon cheered wildly. The Bhagavatar tried something again, but Kutti countered him with the same tactic—carpet bombing followed by thunderous applause. At the end of the Varali, Kutti played an incredible set-piece and landed with a reverberating tom. The tom didn’t land on the samam, but the audience didn’t care. The clapping was accompanied by more than enthusiastic sabhash-es and bhale-s. Two of them even stood up and clapped. The Bhagavatar gave Kutti a bewildered look. Kutti merely smiled and opened his paan box, as if telling the Bhagavatar to not disturb him for a while. Left with no option, the Bhagavatar decided to sing an elaborate Sankarabharanam alapana. It was, by all accounts, quite spectacular. He followed this up with a haunting tanam, which Pillai-val responded to cautiously. The audience, in that half hour had forgotten the little singer-percussionist dynamic that had been playing out until then. But the Bhagavatar hadn’t. He embarked on a pallavi, in what we presumed was a complicated talam, with his right hand firmly under his grand veshti. No one, not even Kutti, could see what talam it was. The bulge of his hand under the layers of fabric made indistinct bobs and let out occasional slapping noises, but these were hardly clues Kutti could read. Kutti developed a safe tactic to keep beat -- he figured out that the words just before the arudi rest were “Guhane vaa”, and by the time the Bhagavatar reached “ha..ne...”, Kutti would enthusiastically thrash his mridangam until he landed on the “vaa”. What he did between the gu, the ha and the ne were dubious, but he unfailingly landed on the vaa. The fact that he didn’t get the rest of the pallavi didn’t matter because his lunch-bribed audience always shrieked, “Bhesh, bhesh!” when he tonked his mridangam emphatically at the vaa. Slowly, Kutti realised that the pallavi was not only in an unusual talam (one that he still didn’t recognise), it was also in an unusual nadai. He couldn’t decipher whether it was the misra or the khanda nadai, but he realised he could confuse the Bhagavatar by just keeping beat at feverish pace in the regular chatusra nadai. The dissonance of the sevens (or the fives!) and the fours made the Bhagavatar screw his face tighter, close his eyes and concentrate harder on keeping rhythm. Kutti had turned the Bhagavatar’s trick on its head. The Bhagavatar had one ace up his sleeve. He turned to Kutti and nodded, indicating that he must play a tani avartanam now. Kutti obliged. Two rounds of tremendously loud and incurably muddled mridangam smacking brought him incredible applause. The Bhagavatar announced that the talam was all wrong, but someone from the crowd screamed, “If you show us the talam, we can tell if it is wrong.” The elaborate lunch had had its full effect on the audience now. 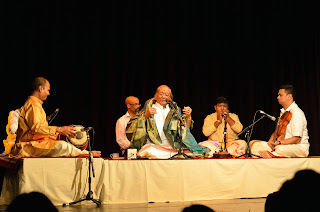 The Bhagavatar finished his concert in a hurry after that, singing a couple of standard tukkadas followed by a mangalam. At the end of the concert, an old man stood up and exclaimed, “I haven’t heard a mridangam like this in decades. What nadam, what clarity! May you live a hundred years!” There was a standing ovation for Kutti. A boy walked up to the front, and picked up Kutti’s mridangam for him, and Kutti exited victoriously. That was the last time the Bhagavatar sang in our area. I moved to Madras with my parents two years after that, and never saw Kutti again. Today, flipping through a Tamil magazine, I saw some photographs from the sets of the film Mridanga Chakravarti. In one photo, in the corner of the frame, an old man seemed to be helping Sivaji Ganesan with his expressions. This man, despite his frailty, had an unmistakable air of regality. The face in the photograph was too blurry for me to confirm the man’s identity, and I was not in touch with anyone from that part of my life, but I’d like to believe it was the same Kuttipayya, passing tips to the great actor on how to behave like you’re playing the mridangam. Ramachandra Guha wrote some time ago on being reminded of Sehwag's batting while listening to Bismillah Khan. Khan-saheb, he wrote, was "both joyful and guileless". This assertion struck a chord, for I've always associated Sehwag's batting with another Indian classical musician, Madurai Mani Iyer, whose music was often described in those very terms—joyful and guileless. Mani Iyer's music makes you sway from side-to-side, it makes you tap your feet, it puts a ear-to-ear smile on your face. His music is audacious, it is irresistible, and when he gets going on those long swarakalpana flights, it seems almost unstoppable. He can be funny, he can be cheeky. He can make your heart skip a beat with the most pure phrase, and he can make you raise your eyebrows with something unexpectedly unorthodox. His music is for the laymen, his music is for the experts. But the more I listen to Mani Iyer, the more I discover how much is hidden below the surface. It is joyful, yes, but it possesses depth that isn't usually associated with joy. It is weighty, and again, that word doesn't always go with joy. It is more scholarly than it initially seems, and somehow, the scholarliness rests lightly on its shoulders. It is pristine classical music, steeped in tradition, soaked in history. That sort of music is supposed to be obscure, inward, pondering. Not joyful, right? The cliche about Test Match batting is similar. It takes years of training, years of experience. It is supposed to be a slow grind. Tantric concentration is key. Physical and mental stamina must work together with technique and judgment to erect monuments. It is supposed to bring joy to those who know what goes into it and be inscrutable to others. Sehwag inverts that idea of Test Match batting, like Mani Iyer did with classical music. His batting is carefree; he often sings when he bats. His batting is intuitive, it is impulsive. His batting isn't about control, it is about letting go. His batting is visceral, it is overpowering. Still, Sehwag is first a Test Match batsman, because, like Mani Iyer's music, his batting has pathos, his batting has weight, his batting is scholarly. Sehwag's technique is underrated. While his feet don't move as much as the purists would like, his balance is faultless. In economy of movement, Sehwag has almost no parallel in his generation. Even so, he gets into great positions, he gets his weight behind the ball, he generates power, his timing is almost otherworldly. When he is batting at his best, there is not one extra flourish, not one unnecessary movement. If that isn't great technique, I don't know what technique is. Madurai Mani Iyer's swara-improvisation is marked for its "sarvalaghu" -- a way in which he spontaneously builds patterns and structures of notes, almost unendingly, one after another, like torrential downpour. Nothing is planned, nothing is pre-set. But following that intuitive path of "sarvalaghu", Mani Iyer created edifices of notes and patterns of such spectacular imagination, executed with such ease and clarity. Musicians struggle to create equivalents with meticulous planning! It sounds easy when you hear it -- he just seems to be singing what comes to him at that point in time -- but it is more difficult than to just reproduce plans. It needs an innate grasp of a dimension of the art that is most elusive -- its philosophy. Mani Iyer grasped that, just like Sehwag understands the philosophy of Test Match batting. Neither might be able to put that philosophy in words, but one can tell from their art (ask CLR James, batting is an art) that they know something subconsciously that most others don't. That insight is what makes their art joyful. Serious health issues deprived Mani Iyer of his voice at the peak of his powers. He came back, singing at a lower pitch, now more a senior statesman than a young maverick. He performed until the day he died. I hope Sehwag comes back from being dropped, perhaps settling for a lower, more comfortable pitch, to delight us with his most unbridled brand of batting for some more years. Dr. Vanathy Raghuraman, daughter and disciple of Sangita Kalanidhi, Dr. S. Ramanathan, has been a vocalist forBharatanatyam for the past two decades. Following in her father’s footsteps, Vanathy Raghuraman ventured into research and obtained a doctorate. An approachable singer, ever willing to encourage young artistes, she has performed with stalwarts like C.V Chandrasekhar, the Dhananjayans, Kalanidhi Narayanan, and Vyjayantimala to name a few. Her honours include the “Best Singer for Dance” award from Sri Krishna Gana Sabha in 1998 and 2004, and the title Sangita Vipanchi from the Balamurali Krishna Trust in 2007. Her success stems from her training in Bharatanatyam as a young girl in Madurai. I learnt music from my father. We are a family of musicians and I was always surrounded by music from a young age. I was giving concerts before coming into the dance world. I did my Bachelors in Music from Queen Mary’s College and Masters at Madras University, where I also completed my Ph.D. My thesis deals with musical instruments and dance details from the Kamba Ramayana. 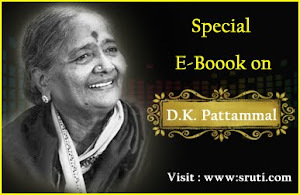 You are one of the few musicians who also learnt and performed Bharatanatyam…. I was always interested in dance. I did my arangetram under the tutelage of Trigokarnam S. Ranganayaki Ammal. I used to come to Chennai from Madurai to perform with Kameswaran’s and SujataVijayaraghavan’s dance group. Once we moved to Chennai I came to the Dhanajayans and studied with them for some time. I also learnt the varnam Manavichekona from Anandhi Ramachandran of Kalakshetra. SK Rajarathnam Sir also taught me. At that time, I sometimes sang for some dance programmes but not in a serious way. I am glad now that I also learnt nattuvangam from Sri Seetarama Sarma. After my daughter was born, I took a break. How did you start singing for dance after that? My nieces from my husband’s family in the US were having their arangetram and asked me to sing for them. I did not have much experience singing for dance, so I went to meet Dhananjayan sir to guide me. He and Shanta Akka took a lot of interest to train me in a meticulous manner. I used to sit in their classes and learn the items performed in their school. The first varnam I learned to sing was Ati moham konden, which I sang for their student the very next day! From then, I have mainly been singing for the Dhananjayans. Over the years, I sang for others like Vyjayantimala, CV Chandrasekhar and Lakshmi Ramaswamy, to name a few. I used to travel extensively for arangetrams abroad, sometimes months on end. Now I have slowed down a little and prefer taking performances here and at my own pace. Without a doubt, my Bharatanatyam training has been the reason why I enjoy singing for dance. Being a good singer does not automatically make you a good dance musician. From the Dhananjayans, I learned when to sing and when not to sing! For example when the dancer is performing a sanchari, Dhanajayan Sir would insist that I give a break for the instrumentalists to take over. This not only gave some relief for the listener but also a chance for the accompanists. This technique is crucial for the success of a show. Besides these tips, I found it easy to sing because I could watch the dance closely and understand where to take a sanchari or what sangati to sing, as I am familiar with the dance mudras and vocabulary. When I am singing, the dancers do not need to fix the number of times to repeat a line, as I often keep a visual cue. I also identify with the mood of each scene and sing accordingly. Did you miss perfoming as a cutcheri artiste? Not at all. I loved singing for dance, maybe because I was a dancer myself. I found it interesting to work with different dancers. Each one has her own style – Kalanidhi Mami’s rendition of padams or Vyjayantimala’s preference for certain sangatis to suit her composition—which keeps me on my toes. Singing for many dancers means acquiring a huge repertoire of songs, with each school differing in the way the composition is sung! That requires practice and alertness. Also getting used to the style of each performer takes time. Some dancers give you the freedom with just a cue to move to the next line while others prefer a fixed number of repetitions for each line. At times, dancers are particular about certain sangatis that must be sung as they would have composed the movements accordingly. That is a pleasure to observe. Sometimes dancers who do not have music knowledge ask me to sing songs from recordings which have not been sung correctly or lack classicism in the rendition. I avoid singing for them. You have composed music for dance. I have tuned songs chosen by dancers for the traditional margam and for dance productions. I have worked a lot on tuning Sangam poetry and lyrics from ancient Tamil literature. For these items and productions I use traditional panns to suit the era of the compositions. Rather than modern ragas like Revati or Vasanti, I set most of these compositions in traditional ragas. I enjoy composing for dance as I can visualize what the dancer wants. Dr. S. Raghuraman has been a great support in your career. My husband Dr. S. Raghuraman has encouraged me as a musician from the time we were married. Later, he too got involved in the dance field as he is a Professor in Tamil with a lot of knowledge and interest in the arts. He has a passion for the Tamil language and has been encouraging artistes to share our rich literary heritage which is suitable for natya. He has been helping dancers with their productions by giving research inputs as well as penning lyrics for dance productions. I have tuned many compositions he has written. He was a great support for my Ph.D as well. Please name some productions for which you have composed. Ashta Nayikas and Rasa of Sangam Age for Kalanidhi Narayanan, ‘Maname Brindavaname’ for Malavika Sarukkai, Puranaanooru, Aalaavadu Eppadiyo and Aindhum Aiyanum for Dr. Lakshmi Ramaswamy, a production on Urmila and Sita for Dr. Draupadi, and ‘Ramayanam’ for Hariharan. You know the Season has truly begun as soon as you open the newspapers on the morning of 1st December and see pages and pages of season schedules staring at you. My opening menu for Season 2013-14 was a book release function followed by a talk on the Melattur Bhagavata Mela Natyam by Dr. Pappu Venugopala Rao at the TAG Centre in Alwarpet on 1st December. Dr. Rao and Dr. Yashoda Thakore have translated into English the ‘Nrtta Ratnavali’ of Jayasenapati, a military general of the Kakatiyas. There was a colourful crowd of over 50 dancers – special invitees – who had been assured of a complimentary copy of the book. After tucking in a traditional breakfast (hosted by the ever-generous R.T. Chari) of kesari, idlis, pongal, vadai and coffee, the invitees assembled in the small, cosy hi-tech hall. The book was released by Dr. Padma Subrahmanyam who presented the first two copies to Sudharani Raghupathy and Chitra Visweswaran. A few more copies were handed over to eminent dancers/teachers like Vasanthalakshmi-Narasimhachari, Malavika Sarukkai, Savithri Jagannatha Rao and Kala Ramesh Rao. The book priced at Rs. 1,200 was on sale that day at a special rate of Rs. 600. It was a short and sweet function with crisp speeches as Venugopala Rao conducted the proceedings with an eye on the clock because R.T. Chari is a stickler for time. In the Southern Heritage TAG lecture that followed, Venugopala Rao presented an overview of the male-dominated Melattur Bhagavata Mela natakam tradition. The participation of Bhagavata Mela artists, made the presentation all the more enjoyable. 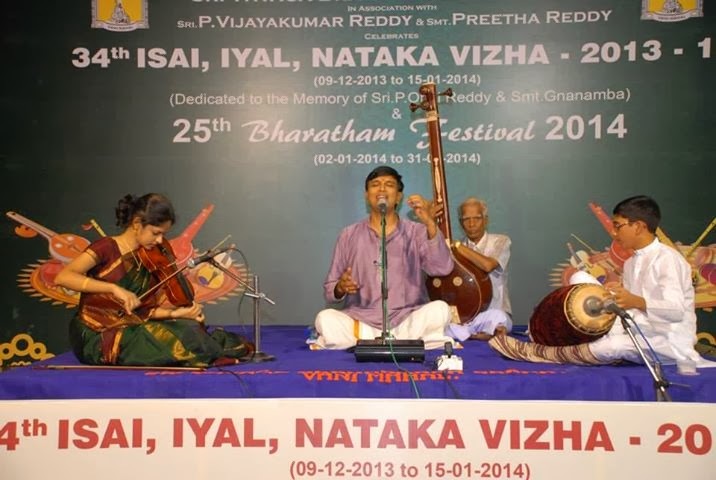 The orchestra was led by the Tiruvaiyaru Brothers (vocal) who sang excerpts from traditional compositions in ragas like Ghanta, Chenchuritti, Kambhoji and Poorvikalyani with depth and feeling to depict some pravesa darus and characters like Leelavati, Hiranyakasipu, Kamsa, and Harischandra. Bhagavata Mela artist Kalaimamani S. Kumar is the younger brother of Bhagavata Mela artist S. Natarajan who has carved a niche for himself for his portrayal of female roles. Kumar is well known for donning the roles of macho kings like Hiranyakasipu, Kamsa, Dharmadeva and Harischandra. His demo that morning of the demon king Hiranyakasipu was amazing. One moment he was the pleasant tech savvy gentleman sitting beside you, but as soon as he stepped on to the stage he metamorphosed into the egoistic arrogant demon king Hiranyakasipu with his superb dialogue delivery, robust gait, quaint neck movements, hand gestures and facial expressions. He won deserving applause from the audience. It was also heartening to see talented next generation Bharatanatyam dancers like Vijay Madhavan and Prasanna take to the Bhagavata Mela Natakam to keep it alive in the decades to come. It would augur well for younger artists to maintain the special quality of Bhagavata Mela movements and not give it the sophisticated sheen of Bharatanatyam. Sudha has had a long and consistent career in Carnatic music. She has come up to this high level by dint of her hard work and discipline. She is sincere and serious about her music, and very punctual too. She puts in as much effort for a kalyana kutcheri as for a sabha concert, whether she is singing for free or receiving more than a lakh for an event. I started accompanying her on the mridangam in 1989 and our latest tour was in May this year to U.S.A. I am indeed proud to have played the mridangam in her concerts for so many years. It has given me an insight into her music and helped develop a sound musical rapport with her. It was Sudha who suggested the name ‘Vibrations’ for my percussion ensemble. In 2006, she even sang for my student’s arangetram in Toronto. 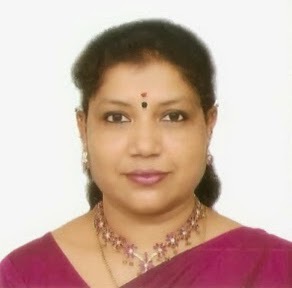 Sudha is a religious person and does a lot of meditation and dhyanam. She has enviable stamina and most of her marathon four-hour concerts are a success. She takes good care of her voice which traverses the three octaves with ease. She is one musician who continues to draw full houses over the decades – from the 1990s to now! You get to see more of the friendly, fun-loving side of her personality when you travel with her. She is an excellent cook too and loves to share some of the delicious items she makes. The journey by train from Boston to Washington this summer for the Morning Ragas series was a memorable experience. Sudha is not one to make undue fuss about acoustics; she will manage with the existing mike facilities in any hall. She does not grudge giving time to her accompanists in a concert; I remember an instance when we played a 40-minute tani avartanam during her concert in Muscat and she enjoyed it. I am very fond of the GNB style because my guru Tiruvarur Nagarajan provided mridangam accompaniment for the maestro. I have had the good fortune of playing for vidushi MLV, for Trichur Ramachandran, and for Sudha Ragunathan. Initially, Sudha’s music resembled that of her guru MLV a great deal. It has always been briga laden, bright and joyous. Sudha also attempts sruti bhedam like her guru. She is fond of exploring prati madhyama ragas. I still remember the Shanmukhapriya raga she sang at Sastri Hall in the mid 1990s. Over the years, Sudha has gradually added her own dimension to the style. She has kalapramana suddham and a good grip over tala. Of late she has been playing with tala changes in her RTPs. For example, starting with Misra Jhampa in a pallavi, she will shift to Khanda Chapu; or from Tisra Triputa to Misra Chapu. Her breezy style has now moved towards saukhyam as she handles more of slow 2-kalai compositions. Her stage presence and music reflect her confidence and success. One of the most glorious epochs in Indian history was when the Pala dynasty ruled over most of what is today Bengal, Bihar and Bangladesh between the 8th-12th centuries A.D. Although much of Pala art is Buddhist, it also has many images belonging to the Hindu pantheon. Stone carvings of Nataraja, Surya, Uma Maheswara, Ganesa and Vishnu of superb workmanship belonging to this era can be seen in various places. Many of the metal sculptures of this period are also excellent pieces of art. An image of Ganesa, carved of black stone, now in the Government Museum, Chennai, belongs to the Pala times. The stone on which it is carved is broken at the top, but fortunately, except for some minor damage, this image is intact. This exquisite sculpture of this deity (Nritta Ganapati) dancing on a full-blown lotus is in tri-bhanga, with three bends in the body and eight hands and not four as is normally seen. His left leg, slightly bent, rests on the lotus. In the uppermost right hand, Ganesa holds a garland of beads (japa mala), held ever so delicately with just one finger. Another hand holds the axe (parasu), the third, unfortunately damaged, is in the gesture of assuring devotees not to fear (abhaya hasta), and the fourth right hand is seen hanging reaching down to the waist and holding an object not easily identifiable. 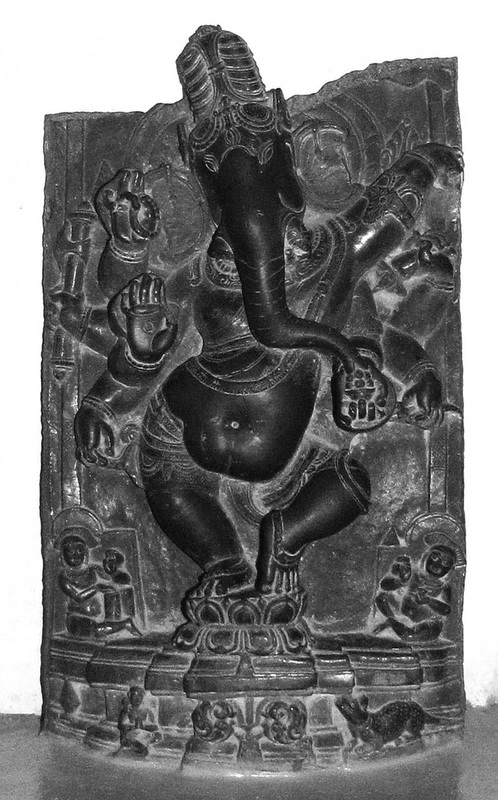 The topmost left hand is uplifted and does not hold any attribute so as to enable Vinayaka to depict various mudras; the second holds the elephant-goad (ankusha), the third holds an object not easily identifiable, but probably is the pasha (elephant-goad) and the fourth reaches out to a cupful of modaka. This image is much bejewelled with crown, necklaces, bangles, armlets and anklets. Flanking the feet of the deity are tiny figures of two Siva ganas playing musical instruments. The one to the dancer’s right plays on two vertically placed drums, while the musician to the left sounds the cymbals. Both the artistes are apparently watching the dancer in blissful rapture, going by the expression on their faces. On one side of the base of the pedestal of the image is Ganesa’s mouse-vehicle (mushika-vahana) and on the other side is a supplicant devotee. The sensitive onlooker can actually visualize this stone Ganesa dance. This anonymous sculptor of the Pala times surely deserves our appreciation. The Attendance annual awards 2013 were presented on 1st December 2013 to seven eminent personalities in the field of dance. Violin maestro L. Subramaniam did the honours and educationist Vimala Rangachar felicitated the awardees. Chiranjiv Singh, President Alliance Francaise, delivered the inaugural address. Veteran guru Maya Rao blessed the awardees. Pada pooja for the awardees was performed by debutante dancers. The award ceremony was complemented by short films and acceptance speeches by the awardees. Madhu Nataraj and Murlimohan Kalva conducted and compered the ceremony. 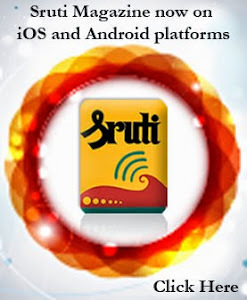 At the age of 82, most of us would probably be bent, bitter, and bed-ridden, unable to hold a straight note in sruti. Here was Padma Bhushan awardee TV Gopalakrishnan, popularly known as TVG, singing with such gusto, energy, and enthusiasm that people half his age would have been left envious. The occasion was the Chembai Memorial Concert at London’s Bharatiya Vidya Bhavan on 25th October, the first such celebration outside India honouring this legendary Carnatic musician of the 20th century. TVG highlighted the musical contributions of his guru by sharing many personal anecdotes with the audience. He also played a few clips that exemplified the famous Chembai style of singing. 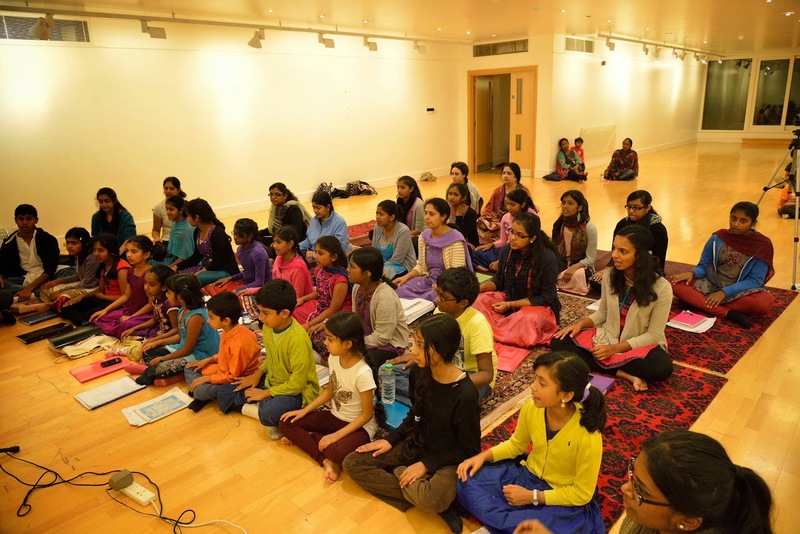 Keeping up the guru-sishyaparampara in London were disciples of Sivasakti Sivanesan who began the evening by rendering as a group such popular kritis as Vatapi Ganapatim and Entavedukondu that have become synonymous with the Chembai style. TVG was in tremendous form, singing with a majestic voice with precision, bhava, grace, and joy. Such music is not just technically perfect but stirs the soul and leaves a special mark in the listeners’ hearts for years to come. The master storyteller that he is, TVG contextualized each piece with a story or anecdote or titbit. For instance, he related how Gopalakrishna Bharati woke up singing Sabhapatikku just a day after Tyagaraja asked him why he had not composed in the raga Abhogi. TVG’s creativity shone brilliantly in the detailed Janaki Ramana set in Suddha Seemantini, a rare raga derived from Todi. 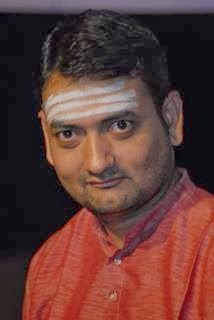 He aptly brought out the beauty, devotion, and gentle purity of this raga that literally means “the pure first daughter.” His magnificent rendering of Nagumomu in chaste Abheri was an excellent example of how to bring out the beauty of this composition without slipping into typical clichés while still maintaining sampradaya. Dr TV Gopalakrishnan is a renowned mridanga vidwan, a trained violinist, an accomplished Carnatic music vocalist, expert Hindustani musician, composer, and sought-after guru. 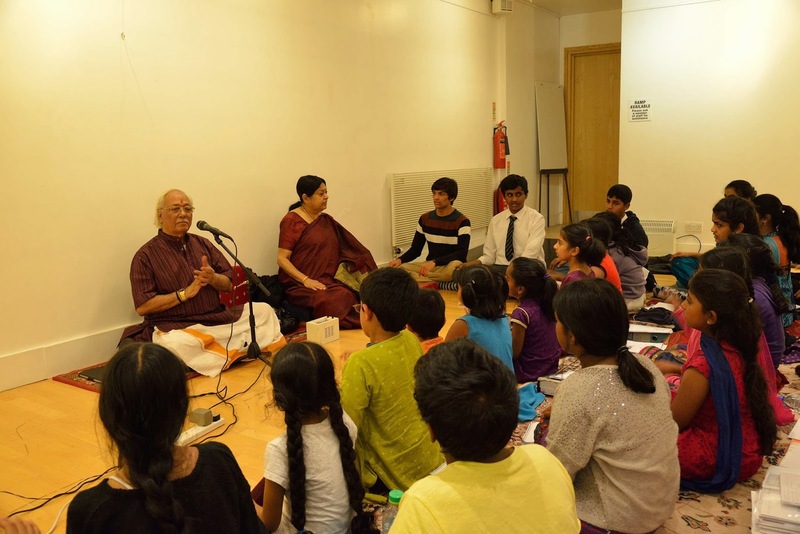 Youngsters from London were fortunate to get to spend quality time in his larger than life presence for an entire week from 21-25 October at the Bharatiya Vidya Bhavan. They not only learnt some rare kritis from the master teacher but also got to experience his generosity, wit, and wisdom. TVG picked some simple yet beautiful nottuswarasahityams of Dikshitar such as Santatampahimam and Varasiva balam apart from his own composition called Arunachalame in the raga Sivaranjani to teach the children. 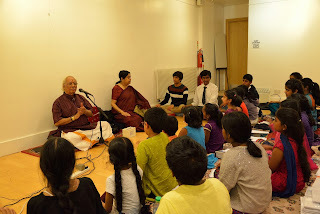 Based on the request of the workshop attendees, he also included a moving and meaningful Hindustani bhajan Nirdhanko by Kabirdas in the agenda, thus teaching the children the differences between the two main systems of Indian classical music. Every session was dotted with TVG Sir’s anecdotes and interesting stories about his guru, Chembai. He told us about how Chembai lost his voice for about eight years and got it back miraculously. Another story was on how Chembai’s rendition of a particular song led to heavy downpour just as he had warned his audience who had insisted on him singing the raga. TVG offered many tips to students on voice culture, aural sensitivity, spiritual aspects of music, the significance of the guru-sishya relationship, balancing music with other activities, and the different types of gamakas used in Carnatic music. He shared them with much generosity, sincerity, and caring for the students in a loving and patient manner. Overall, it was an unforgettable week of intense learning that left us students feeling inspired, energized, and very grateful.